A father and son planted watermelon seeds in a field. They returned the next day to find that the field was covered with holes and that their seeds had been eaten. The peasants were upset but accepted what had happened and decided to plant more seeds in the field. This time, the father sent his son out at night to keep watch over the field. “These seeds are delicious!” said the younger of the birds as it dug up some seeds. Having heard the wise words of the crow, the young peasant did not hold back. 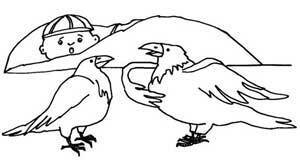 The crows were startled, and flew further away from the young man. “If you eat the seeds, there won't be any watermelons at all!” exclaimed the young man. “You are not a crow – you're a watermelon expert!” exclaimed the young man, enraptured by the bird's wisdom. “We been feeding in watermelon fields for over one hundred years. We have learned a lot in this time,” replied the elder crow in an important-sounding voice. “Farewell then, for it is time for us to go,” added the younger bird. As soon as the crows had disappeared, the young man ran home to collect some smaller watermelon seeds. He planted them into the holes left by the crows. 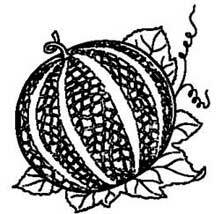 The young man did everything which the crows had suggested, and the field yielded an excellent melon harvest. When the watermelons matured, the young man went out into the field. “Follow me,” replied the largest watermelon. It detached itself from its stalk and began to roll across the field. It rolled along the road, the young man following closely behind. Every so often, he would stop for a nap, eat some watermelon, and then set off again. With the watermelon for a travelling companion, neither thirst nor hunger were a problem. “Is it really possible to eat nothing but watermelons?” asked the astonished young man. “Make a hole in my rind and try my honey,” suggested the watermelon in response. The youth did as the fruit had suggested, and drank the juices from inside the watermelon. “It is not difficult to make watermelon honey from fresh watermelon juice, and it has the same medicinal properties as bee's honey,” replied the watermelon. The watermelon also offered the young man salted watermelons and hard watermelon sweets made from its rind. 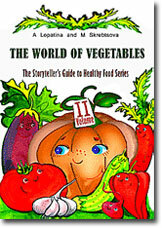 “Watermelon sweets are a good cure for liver stones,” explained the watermelon. One day, the young man was attacked by bandits. The head bandit ordered the young man to pay a ransom, but the traveller had no money. The young man again followed the watermelon's instructions. When the chief's pain had subsided, he spoke to the young man. “All right,” replied the young man, “but one watermelon will not last very long. You will need to eat watermelon every day to keep your liver and kidneys healthy. I will need to plant a field of watermelons, and your bandits will have to help me clear a plot. To begin with, the bandits complained, and many were exhausted by the hard work. Several even fled the group, but those who remained became excellent melon farmers. 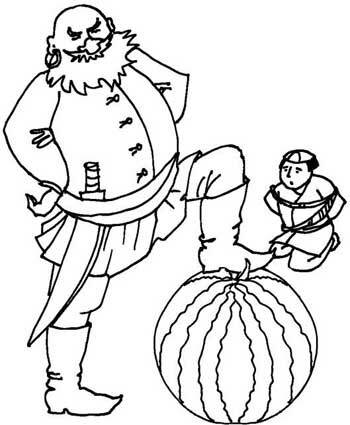 Their large watermelons, with their thick, dark rind, became famous throughout the region. They sold out within minutes at the market. The young man, however, continued his journey with the magic watermelon. The fruit led him into the desert, before it suddenly dived into some bushes. As the young man approached the bushes, he gasped with amazement. In front of him, he saw the same familiar-looking stems spread across the earth, and on each one sat small, round watermelons. “How on earth can watermelons grow in the desert?” he asked in astonishment. The young man travelled for several years, and gathered many varieties of watermelon seeds on his journey – white, yellow, brown, red and black. In one village, he stopped to find a bed for the night. The moment the young man laid eyes on the melancholy beauty, he fell in love with her. When the white watermelon flesh found near the rind is blended, the resulting juice has remarkable diuretic properties (helps the urinary system). It is not only medicinal, but tastes delicious when mixed with apple juice. Watermelons and other melon varieties contain a large quantity of water. It is pure, organic, distilled water which is very easy to digest.